During you or your loved one's battle with cancer, many treatments (surgery, chemotherapy, radiation, alternative therapies) may present themselves. It is important to understand what each treatment is, the role it serves, and the research behind it. This section provides some of the best resources we've researched that will help you understand your treatments better - which in turn will help you ask better questions, feel more prepared, and stay ahead of possible side effects. Note: For most individual's battle with cancer, chemotherapy is the major treatment option and will be presented as the recommended treatment. Chemotherapy can be a foreign, confusing thing for those who have not had previous experience with it. The good news is that there are lots of resources dedicated to helping you understand chemotherapy and how to prepare for its side effects. First, we want you to feel comfortable knowing what chemotherapy is. Don't be embarrassed if you don't know, we were not familiar with it all. Spend a few minutes to familiarize yourself with chemotherapy - what it is, terms associated with it, and the science behind it. Here's a good quick chemotherapy overview. Now that you understand chemotherapy a bit more, it's important to take the necessary steps to prepare for treatments. Here's 11 Helpful Tips to help you get through chemotherapy treatment. As a caregiver / family member, we highly encourage you or the appropriate member of your team / family read this book if chemotherapy is going to be part of your treatment. 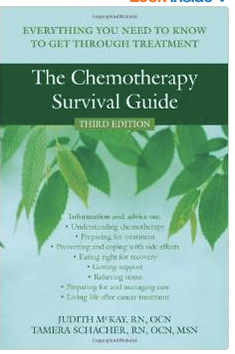 The Chemotherapy Survival Guide was written by two registered oncology nurses in California. The book is technical while also practical. It helps you understand the medicines involved with chemotherapy and how to mitigate side effects, which can be very severe with chemo and varying cancer types. Order a copy, and find the right team member to read. Note: We don't recommend the patient themselves reading. This is a book for a caregiver / family member to help the patient navigate chemotherapy - it's technical and we feel the patients energy is best spent elsewhere. Integrated medicine is an important term that you may have heard already, multiple times, but not quite sure exactly what it is. By it's definition, integrative medicine is all-encompassing healing-oriented medicine that takes account of the whole person (body, mind and spirit), including all aspects of lifestyle. It emphasizes the therapeutic relationship between mind & body and makes use of all appropriate therapies, both conventional and alternative. Good examples of integrative medicine treatments include things like meditation, yoga, herbs & supplements, vitamins, massage therapy, acupuncture, and many more treatments that might not traditionally be offered by a western oncologist, but only recommended. MD Anderson's Cancer Institution in Texas has one of the country's best integrative medicine centers. Their integrative medicine program website does a great job highlighting treatments, explaining key concepts and information. We recommend reading the "Reviews of Therapies" section on the site. By now you may have heard the term "clinical trail." Similarly to chemotherapy, don't be embarrassed if you aren't familiar with what a clinical trail is and the role they may play. First things first, let's define clinical trial. A clinical trial is a medical study led (in many cases) by a hospital / institution or a pharmaceutical drug company. In a clinical trial, patients receive specific interventions according to the research plan or protocol created by the institution behind the study. These interventions may be medical products, such as drugs or devices, procedures, or changes to participants behavior such as diet. Clinical trials may compare a new medical approach / treatment to a standard one that is already available, to a placebo that contains no active ingredients, or to no intervention. Some clinical trials compare interventions that are already available to each other. More information here. Put simply, clinical trials are a way for medical institutions to try new drugs, treatments, & medicine to a select group of patients to see if they work, are effective, and could be rolled out nationally, even internationally. You have to be accepted into a clinical trial but your oncologist or doctor can help you enroll. If a new drug makes it way through all phases of a clinical trial, it can become the standard of treatment for a particular disease. Most all medicines / treatments available to day nationwide, were once in clinical trials. The most comprehensive clinical trial database, is the U.S. National Institute of Health's Clinicaltrials.gov website and database. Here you can search available studies by disease and also look up any study by it's Identifier Number. The site is a great resource, however, it is very technical. Reading clinical studies can be confusing and a bit overwhelming. If you have a member of your caregiver team that has a medical background or is familiar with medical research, we encourage you to have them help you understand and make sense of the website and studies. The database lets you know what the criteria are to qualify for the study, where the study is being conducted and of any initial results. For example, there could be a Phase 3 clinical trial that you qualify for but your hospital or medical center might not be running that particular trial. It might be running at a nearby institution. It is important to take the time to understand the different phases, where the trials are being conducted, which ones you may qualify for, which trials your institution is conducting, and what your options are. Ask your doctor about clinical trials and to help you enroll. Fortunately, there are many organizations that can help you understand the roles clinical trials may play in your treatment, what options are available to you, and how to enroll. For example, the Pancreatic Cancer Action Network's (PanCan) Patient Central program, that we have referenced here, contains its own clinical trial database and representatives are available to help you navigate what options are available, what you qualify for, and where - as it pertains to pancreatic cancer. However, there are other organizations / nonprofits that may be able to help you navigate clinical trials. Why is this important? In our experience, having contacted PanCan's Patient Central program prior to our first doctor's consult, we left the consultation with 5 clinical trial options as opposed to only 1. We have helped you better understand chemotherapy, clinical trials, and managing side effects with treatment. However, there are still quite a few more types of treatment that may be presented to you as options in your fight against cancer. The American Cancer Society's website has a good quick informational overview of these other treatment options such as radiation, immunotherapy, targeted therapy, and integrative medicine options. Learn more here.